The punishment given Robert Savinetti, 59, was the maximum for his conviction on a misdemeanor charge in the 2017 death of girlfriend Lisa Miceli, 44. He was acquitted in January of manslaughter and other felony charges. A judge sent Long Island cover band musician Robert Savinetti to jail Monday for his girlfriend's vehicular death, giving him the top sentence of one year behind bars after a misdemeanor conviction by a jury that also acquitted him of manslaughter. "You deserve significant punishment for your actions that night that resulted in the death of Miss Miceli," acting State Supreme Court Justice Terence Murphy told Savinetti, 59, of Melville, while sentencing him in the death of Lisa Miceli, 44. Prosecutors had alleged at the January trial of the Copy Cat band member that he treated the Melville woman like "roadkill" by running her over with his Toyota RAV4 on Aug. 1, 2017, and leaving her in a Seaford street to die after an argument at Cardoon Mediterranean restaurant about her smoking habit. The defense had argued Miceli was to blame for her own death after she ran next to the moving RAV4 while drunk and in flip-flops, before tripping and falling beneath the vehicle. 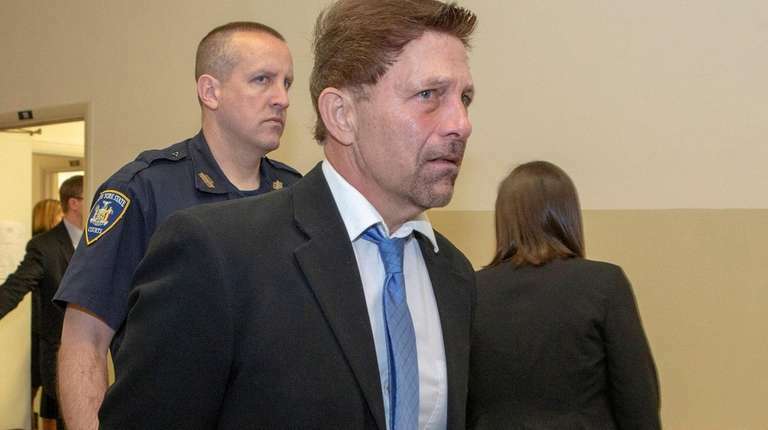 The judge said Monday he considered evidence of Savinetti's drunkenness in deciding the sentence, evidence jurors didn't hear before they found the motorist not guilty of felony charges that also included leaving the scene of the crash and criminally negligent homicide. The jury, which convicted Savinetti of a reckless endangerment charge, never knew Savinetti's blood-alcohol concentration that night had been 0.12 percent or slightly higher. The legal threshold for intoxication is 0.08 percent. Citing missteps in the police investigation, a different judge suppressed that and other evidence before the trial. But Murphy said at Monday's sentencing that the law let him take evidence of intoxication into account when punishing Savinetti, whose actions he said "tore apart a family that can never be repaired" — with the victim's twin sons now motherless. Prosecutor Tara DePalo told the judge Monday that Savinetti's arrest in the case was his third involving drunken driving allegations. She said it was clear to the jury that the musician's conduct was criminal and that Miceli didn't die as the result of an accident. DePalo also pointed to a letter Miceli's mother, Jeannette McInerney, wrote to the judge that spoke of her disappointment in the verdict and joined prosecutors in asking for the maximum sentence for Savinetti. The musician cried in court Monday as he told the judge that his life "will never be the same" without Miceli. "Her life was taken way too soon, and I apologize for the role that I played in her death and accept responsibility for that," he added. Savinetti also said photos of Miceli still adorn his home and there wasn't anything he wouldn't do to bring her back. "I lost both of my parents to cancer specifically caused by smoking and wanted to save her from that fate," Savinetti said. Defense attorney Marc Gann told the judge his client knew he had to pay a price for his role in Miceli's death, suggesting that a lesser jail sentence combined with probation "would serve justice." During the trial, Gann told jurors his client didn't realize he had run over Miceli, and had come back to the scene when the restaurant owner called to tell him that the woman was badly hurt in the street. But prosecutors had alleged Miceli was holding a door handle, banging to be let inside when Savinetti stepped on the gas and Miceli lost her grip and was pulled under the Toyota, which crushed her before he drove away. "I have no doubt that you loved Miss Miceli, but on that particular night you didn't respect her," the judge told Savinetti. "You're not going to save a person from lung cancer by dumping them on the side of a road when you've had way too much to drink." Savinetti declined to comment as court officers led him away in handcuffs. "We hope that this sentence helps in the healing process," Nassau district attorney's office spokesman Brendan Brosh said later of Miceli's family.